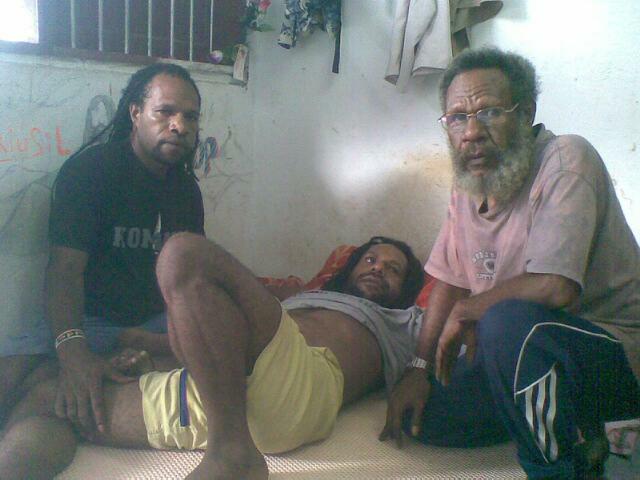 Papuan prisoners in their cell in Biak prison: Numbungga Telengen (black clothes), Jefrai Murib (sleeping) and Apot Lokobal (wearing glasses). Jafrai Murib is thought to have suffered a stroke on 19 December 2011 which has caused paralysis. He can no longer stand. I am often in and out of prisons to deal with political prisoners, so I know many detainees and their families and lawyers. 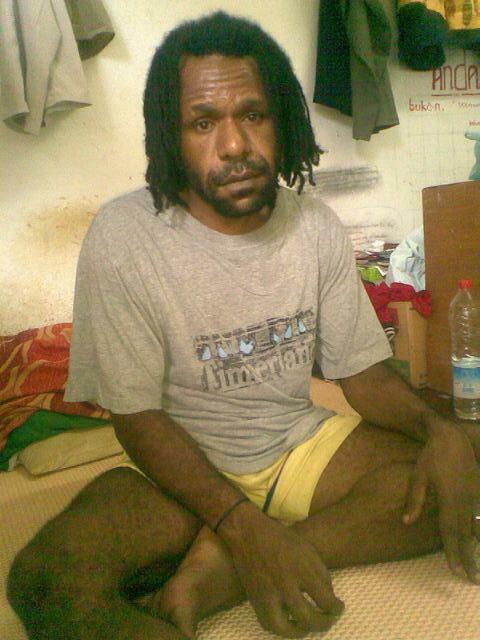 Last week, I received a message from somebody representing three Papuan prisoners in Biak prison. He said that prisoner Jefrai Murib is thought to have suffered a stroke on the morning of 19 December 2011. He’s paralysed. He can’t walk. When he walks he does so with the aid of his friends. The left side of his body, his left leg and his left arm have lost all sensation. Murib has had a check-up in Biak General Hospital, where the doctor referred him to Jayapura hospital. Biak hospital is not as well equipped as Jayapura hospital. Murib is in a cell together with Numbungga Telengen and Apotnagolik Enos Lokobal. 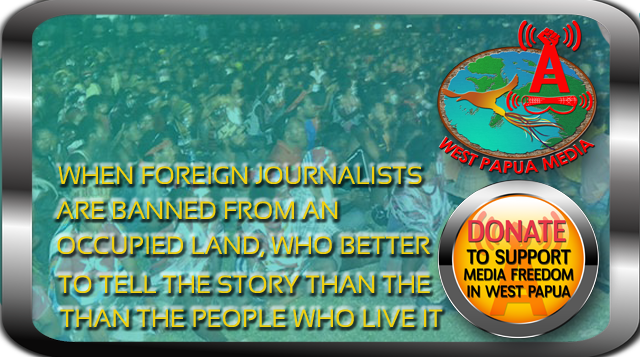 They were arrested in April 2003 following a raid on a Wamena weapons store. Murib and Telenggen got a life sentence, Lokobal was sentenced to 20 years in jail. Lokobal also suffers from the same symptoms; the right side of his body has lost all sensation. He has also been seen twice at Biak hospital, on 12 November and 23 November. Lokobal is also suspected of having suffered a stroke. Unlike Jafrai Murib, by last week Apot Lokobal was able to walk again, although his steps are weak and faltering, and he has to be carried when taken to hospital. Lokobal needs more specialised medication. The Indonesian state is responsible for providing healthcare to prisoners. I hope that the health condition of these two prisoners will be taken seriously by the Penitentiary Director General. In accordance with the doctor’s recommendations, Jefrai Murib should be moved to Abepura jail in Jayapura, and needs to receive medical attention at the Dok Dua Hospital in Jayapura.